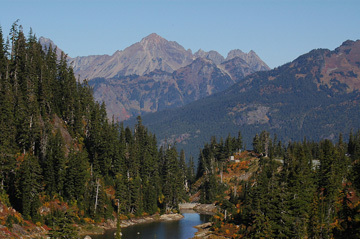 The North Cascades Ecoregion includes the Cascade Mountains west from the Cascade crest and north from the South Fork Snoqualmie River drainage (I-90 corridor). Its lower limit is approximately the 1,000-foot contour, a few miles east of the Puget Trough communities of Sumas, Sedro-Woolley, Arlington, Granite Falls, Sultan, and North Bend. It extends northwest into British Columbia. The North Cascades of Washington compose a highly dissected mountain terrain created by volcanic activity continuing into recent times. The two tallest volcanoes, Mount Baker and Glacier Peak, last erupted as recently as 10,000 - 12,000 years ago. Mountain peaks over 10,000 feet plunge quickly into valleys as low as 500 feet above sea level, cut out by ancestors of the vast glaciers that still sprawl in the northern part of the region. Glacially carved U-shaped valleys and cirques are therefore prominent features. Some of these have been dammed to form large reservoirs, notably Ross and Baker Lakes, and there are also many smaller, natural lakes. The major river systems of the region - Snoqualmie, Skykomish, Stillaguamish, Skagit, and Nooksack - flow toward Puget Sound. High precipitation typifies this ecoregion. Huge masses of water-logged clouds come out of the ocean and slam into the mountain range most of the year. Valley bottoms, near the western edge of the region, are typically dry, more Sierra-like in climate and receiving less than 50 inches of rain a year, while higher elevations receive over 100 inches, mostly in the form of snow from October through April. At higher elevations, 20 feet of snow on the ground is standard during the winter. Temperatures are mild in the valleys all year, but the higher mountains are cool in summer and very cold in winter, with permanent snow and ice at high elevations. The vegetation in this ecoregion is stratified by both elevation and amount of precipitation. At low elevations, the predominant trees are western hemlock, Douglas-fir, and western red cedar, with a dense understory of ferns and shrubs such as salal and huckleberries, exactly as the Puget Trough Ecoregion. Forests at middle elevations are composed mainly of Pacific silver fir and western hemlock, with lodgepole pine, larches, Engelmann spruce, and Douglas-fir locally abundant and many of the same shrubs that dominate the lowlands. At higher elevations, forests of mountain hemlock and subalpine fir alternate with open parklands. Above the treeline, alpine heaths, meadows, and fell fields are interspersed with barren rock, ice, and snow. The region also contains forested and open wetlands, riparian areas with broadleaf trees, and avalanche chutes dominated by Sitka alder, vine maple, and blueberries. More than 96 percent uninhabited and uncultivated, the North Cascades show the lowest human impact of any of the state's terrestrial ecoregions. Large areas are protected in North Cascades National Park, Ross Lake National Recreation Area, and several wilderness areas, but logging has occurred widely at lower elevations. Recreation associated with natural environments (hunting, fishing, hiking, snowmobiling) may have minor effects on bird populations.